Perhaps you’ve found yourself reading through online review after online review, wondering if that negative feedback or half-baked testimonial could really affect your business. Well, let’s look at the numbers: 92% of prospective clients read online reviews, and 40% of those clients will form an opinion on what you’ve got to offer after reading only two. That’s just two opportunities to grab a prospective client’s attention and impress them – in other words, your chances are only as good as the two random reviews they land on. While there are plenty of crowd-sourced reviews on websites like Yelp, Google Reviews, and Angie’s List, there’s no controlling or monitoring the quality of the reviews customers will find. That considered, those first two reviews determine whether they pick up the phone and call you or move on to someone else. That’s where eEndorsements comes in. We are a client review management and marketing platform that provides an invaluable tool for your business: We help you collect and process client reviews seamlessly, automatically turning your best reviews into SEO-friendly web and social media content to promote your success. 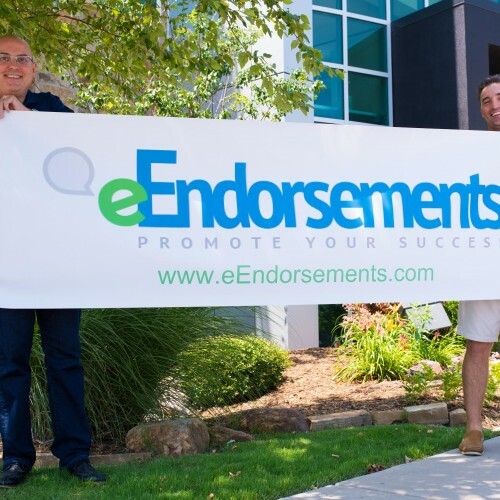 eEndorsements is more streamlined and controlled than crowd-sourcing reviews. We help you push positive client reviews to the sites that matter, ensuring that your potential clients hear exactly what they need to hear, without any of the noise. Our platform also helps you generate leads, share testimonials, and build surveys that your business can use to generate even more client feedback. Though there’s a multitude of ways you can use our platform, the best part of working with eEndorsements is your connection with our small, efficient, and accessible team. You’ll have a great experience with eEndorsements, and that will help you provide an even better experience for your own clients. Contact us today to learn more about how eEndorsements can help grow your business, or visit our siteeendorsements.com and our Facebook to see more from our customers.